Looking for Fun Makeup Games and Party Make Up Ideas? 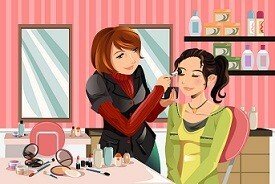 Makeup games are another way you can have fun and experiment with makeup. Besides beautifying, you’ll find out here about more ways to use makeup. So I'll lay out where to find good makeover games, and how to apply makeup for special events like Halloween, kids’ birthdays, and whatever else your mind can conceive! Make up games for girls and teenagers are plenty on the internet. They’re basically virtual dolls that you can dress and beautify to boot! They’re a lot of fun and surprisingly (yes I tested them…), kids- and erm- adults too… can pass hours just playing these games! There are some great animated games online that can keep you occupied for hours. If you’re older though, you may be looking for games and applications that you can use to practice your make up and hair before committing to a look. Really good makeover programs are really hard to find but there are a few. There are some where you can upload your own photos, or practice on a real model picture for a more realistic effect. These are basically virtual makeovers and n be very usefull. There are also physical games you can play with makeup. They're appropriate for most girl only events! This can be for the entrepreneurial makeup sales party, or a teenage sleepover. Then for the lucky, trusted friend preparing for a bridal shower, makeup is great prelude to a night out! I’ve been to bridal showers where the bride to be does absolutely not want to see lingerie or have highly toned beefcakes shaking their junk in their face, so these games can be a PG, useful, and fun alternative. There are a number of events that require a mom or dad to pile on the makeup! If you really don’t want to spend too much money hiring a professional, and have heaps of fun with your kids then you want to use these guides. Learn here how do your own Clown makeup, Halloween makeup, and kids face painting at home.